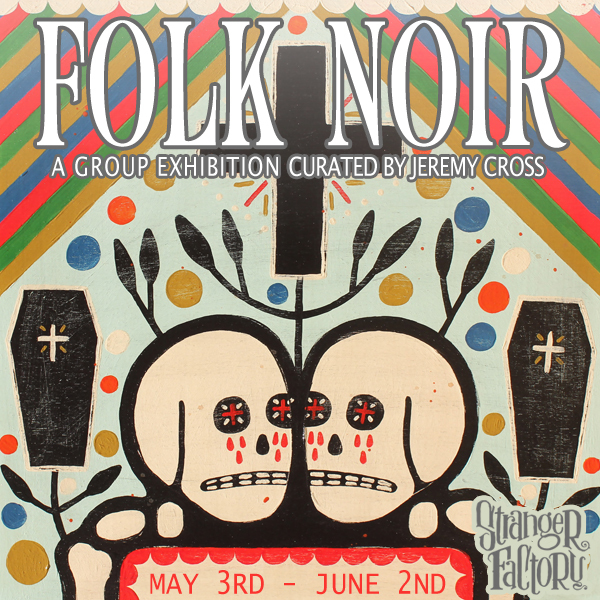 Stranger Factory is pleased to present FOLK NOIR, a group show curated by Jeremy Cross! As a curator, Cross has always had an appreciation for work that cradles the borders between fine art and folk art, particularly when the artists subject matter is macabre or Noir. Works in this show are unique not only in approach and theme, but also in the unorthodox use of materials. From sutures holding together bits of Victorian ephemera, skeletal remains fashioned from crochet string, to the incorporation of animal bones. From humble beginnings to elaborate creations they are imbued with both familiarity and wonder. Stranger Factory is happy to present Vanessa Ramirez in her show, EVERYTHING IS FINE. Are you having a bad day? You’ll feel better when you see this show. Ramirez brings her signature monsters back to Stranger Factory, but it looks like they are having quite a rough day. They are all feeling some kind of way and some are frankly coping better than others. In typical monster fashion, they are feeling their feelings, hitting those self care snacks hard, or drinking that magical coffee that just makes everything a little bit better. Ramirez is a returning artist at Stranger Factory. She is known for her monsters that float between a mixture of cute, odd, and a little neurotic. Inspired by traditional stop-motion animation, her sculptures come to life in what appear to be expressive snap-shots of their daily lives.